GearBrain breaks the best VR devices you can buy today for under a C-Note. If pricing for the Oculus Rift, HTC Vive and Sony PlayStation virtual reality headsets is giving you sticker shock, check out the following five. Powered by mobile phones—instead of computers or consoles—these devices are far less expensive, yet still deliver a solid virtual reality diversion. Below, find our picks for the best VR headsets under $100. Do you already a headset made out of cardboard, but wish the device were a bit more durable? The Noton VR may be bare-bones, but the headset is sturdy, light-weight, holds any brand or size of phone, and has straps for your face. You can't adjust the lenses, the headset doesn't fit over glasses, and Noton lacks a control button and padding. Remember: It's a solid piece of plastic. However, the lack of padding makes the device very easy to clean. This headset is very easy to use, since you just drop your phone in and then hold the headset to your head -- nothing to adjust. When I give presentations about VR headsets, this is one of the first that people reach for. Did I mention Noton is only $6? Similar headsets are also available on Amazon, such as this pink VR Box for $7, and this $10 VR Mini headset, that comes in five different colors. For around $11, the Mattel View-Master Deluxe VR Viewer is a colorful, sturdy device — that does have a control button—and comes with cute augmented reality experience reels. "The downside? No straps, so you have to hold the headset in place against your eyes, and it's too small to fit over glasses. The lenses are also not adjustable, and those "experience reels" are just a marketing gimmick. Instead, go to the app stores and download one of the thousands of free, low-cost virtual reality apps and videos. VIEW-MASTER VR is on Amazon and on Walmart. Want a headset no smaller than your sunglasses? Check out the $10 Goggle Tech C-1 Glasses. The device lacks sides, a top or bottom, or even straps. But the headset is a very easy way to quickly watch a virtual reality video—or demonstrate a VR app to a friend. Alternatives include the Homido Mini, the Baofeng Mojing Small, the Cobra VR, and the VR Fold. You can buy this headset on Amazon. Although the priciest set on this list, the Samsung Gear VR ($93) comes with a motion controllers, along with extra built-in sensors for a better experience. There's also a trackpad, back button and volume control built right into the set. Gear VR has some great games in its app store as well, and is more robust, supporting Netflix and Hulu. The downside? (You knew there had to be one.) The selection of games is still small and the games are pricier than similar games for the Google Cardboard. Plus, Gear VR only works with late-model Samsung phones. 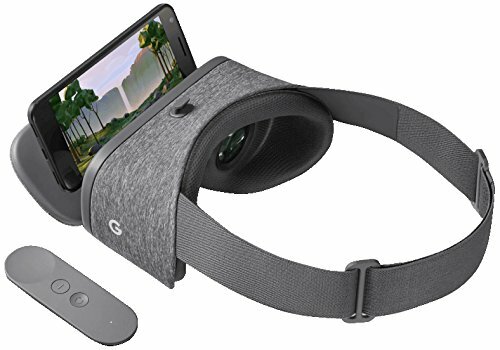 If you have a late-model Android phone, the best VR headset for the price is the Daydream View. It comes with a motion controller, is extremely easy to use and lightweight, and has a large collection of apps — including Netflix and Hulu. A basic model is just $39 on Amazon. Check the list of supported phones before buying. Plus, it's an open standard, so you can find similar headsets from many other manufacturers. If still not sure about which VR headset is right for you, check out GearBrain's 11 Best VR Headsets or 11 Questions About Virtual Reality Headsets Before You Buy. Either of these articles will help you find the right VR glasses or headset that meets your virtual reality viewing needs today.